As creators, we put so much time and effort into each piece of content we produce that we should always be looking for ways to get the most out existing content. To an extent, this can be done by tactics such as reposting on social media, paid promotion and so on. But in this article, we want to show you how you can recycle old content whilst also turning it into something genuinely new and useful. 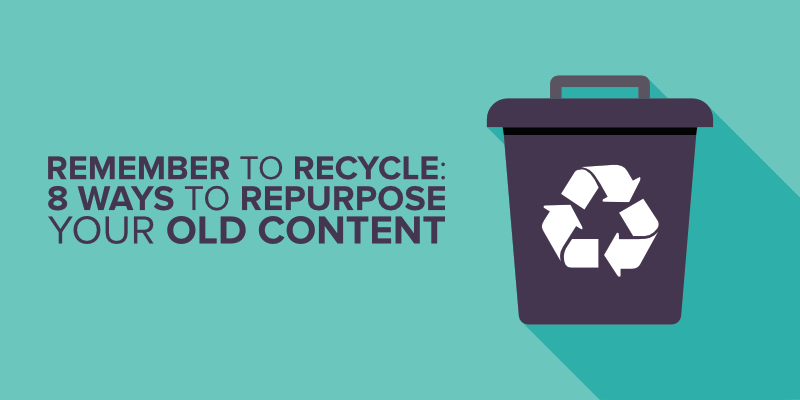 The first and most important rule when repurposing old content is that you must add new value to the content you’re are about to recycle. If you’re turning a blog into a podcast, for example, it won’t do to simply have people reading out a slightly edited version of the article users have just read (more on this below). 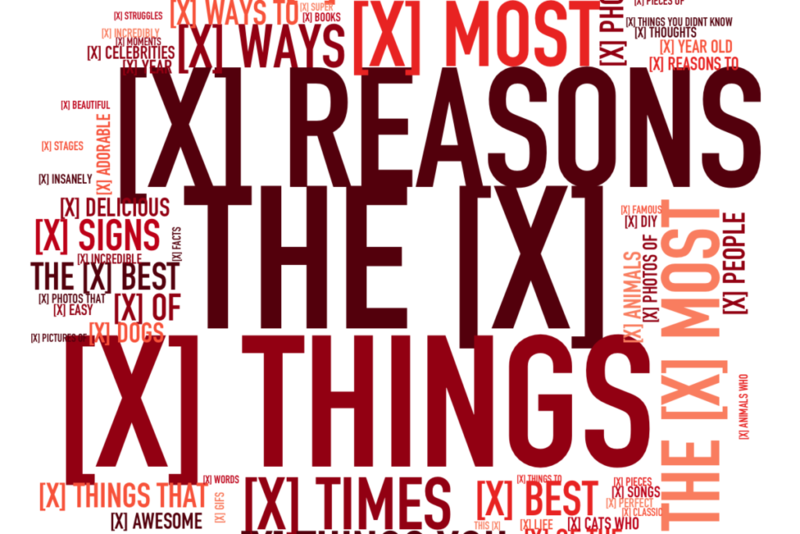 Listicles are a great way to introduce topics to audiences and offer a jumping off point for exploring new ideas, a bit like this article itself. Well, the trick here is to take a high-performing listicle you’ve published and then create separate pieces of content expanding on the items contained in the original post. Not only is this a great way to turn one article into a number of smaller ones, but by going into more depth you are adding lots of value to the original content by deepening the reader’s understanding of the subject. Tip: Each item in the listicle will already have been put in context by the post it appeared in. Make sure you find a hook to transform what is essentially a sub-heading into a full-blown article. The reverse of the above is also true. You could group together a bunch of well-performing posts on a single topic and condense them into a summary-style listicle post. Each list entry can link back to the article that it’s based on. This means that not only will you be able to introduce readers to a new topic in a holistic way, you’ll also be able to extend the life of those articles by encouraging visitors to read posts that may be buried far down your content index. 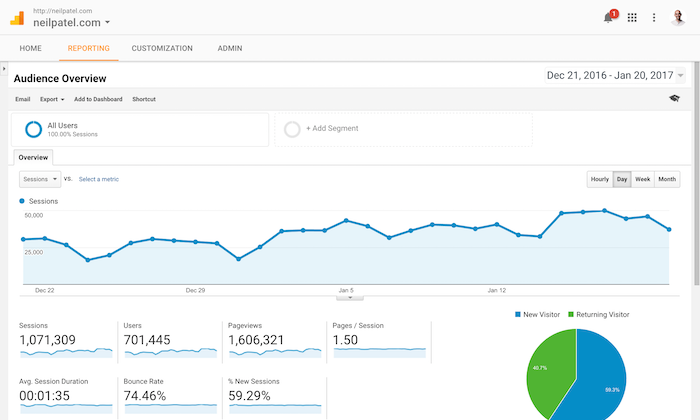 Tip: make a list of your most popular content. Then group that list together by themes. Look out for subjects that would hang well together in a single post. 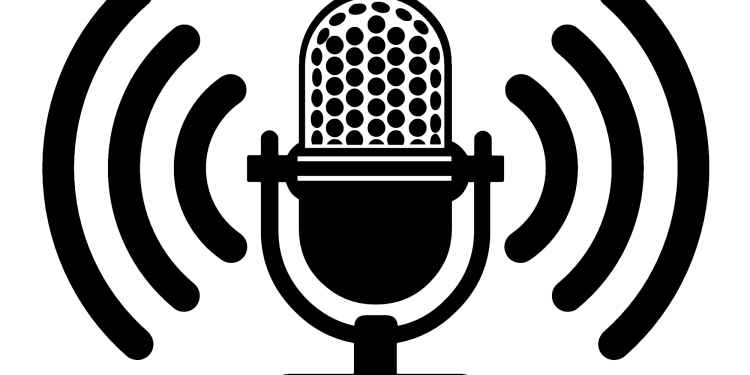 There’s no stopping the rise of the podcast; this fledgling medium is becoming an increasingly common element of content creation and has rapid uptake in the marketing world. If you have a podcast, or are thinking of creating one, then it’s a great idea to transform an article or blog into a podcast. A word of warning: if a user has read half an article and then clicks on a podcast link, only to hear the content they’ve just read spoken back to them, they’re unlikely to continue listening. Tip: Your blog should essentially be the foundation on which your podcast is based. Although many podcasts are scripted, they usually strive to reproduce the effect of two or more people having a conversation about a topic. The ad-libs and natural speech patterns of podcast hosts give them their own unique character. As with podcasts, video blogs (vlogs) are a medium unto to themselves and have their own styles and conventions. It’s best not to think of vlogs as a primarily visual medium, but as a visual-audio medium. For example, vlogs with poor visuals but good audio are much easier to consume than blogs with great visuals but terrible sound. With vlogs you can add a visual element to your old content, whilst delivering information via a script or natural speech. Vlogs can be very informal; it could just be a person sitting in an office at a webcam with cutaways to any charts or graphical elements, or it could take the form of a screen-cast where a presenter walks audiences through the source material the vlog is addressing. Or you could turn it into a mini-film, like Nerdwriter do. Tip: use the vlog to elaborate on aspects of your original content that you didn’t have space to go into. Let’s say your original content featured a number of charts or visualisations; your vlog could feature a presenter talking about each chart in more detail, maybe talking about where the data came from or bringing in other related data that wasn’t in the original post. We’ve been making the assumption that you have started with a blog and are looking to extend the life of your content by branching out into other mediums. But it might be that you started with a vlog or podcast (or chart or interpretive dance for that matter) and want to repurpose that. Tip: when turning a podcast into an article, listen to the episode with the aim of extracting the key points, and then expand on them in the blog. This is an opportunity to back up opinions with data and links, and to structure information in a digestible way for readers. Turning your blog content into a slide presentation is a great way to reach a very motivated, targeted audience. People who visit sites like SlideShare are looking for high-value, insight-rich content that gets them to where they want to be. 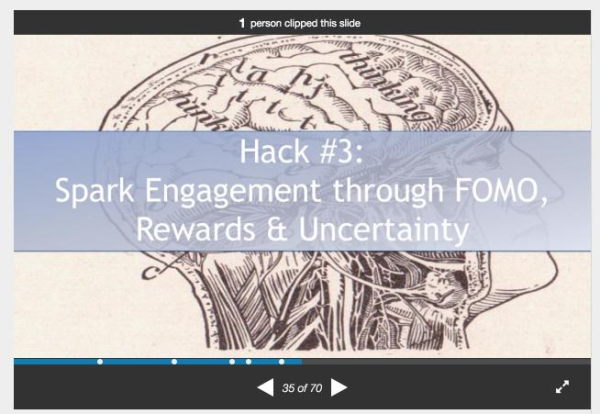 Tip: Slides are a great way to chunk down complex or in-depth information into bite-sized nuggets of insight and wisdom. Because slides are a highly visual medium, you’ll need to condense blog content into readable snippets. That’s ok for a blog which has lots of space to elucidate on points and provide plenty of context, but it’s no good for a presentation slide; the slide is actually a very heavily compressed paragraph, presented in an easy to read manner. Your copy needs to fit that format. So much content is copy-based, it can be refreshing to really take advantage of the visual nature of the internet by turning existing content into infographics and data visualisations. The trick here is to break down your existing content into small pieces, condensing the main concepts into short sentences, replacing text with images where possible and accentuating stats, quotes and side-by-side comparisons where possible. Tip: A good idea is to open a blog/script etc. in a Word doc and start hacking out unnecessary words, rephrasing content simply and changing font type and size to get an idea of how effective the end result will be. Another good tip is to print out your infographic so that you can take a step back and assess how visually appealing and easy to read it is. Once you’ve done that you can either send your edited content to a designer or use online infographic tools like Venngage to create the end product. As you can see, there are myriad ways you can extend the life and reach of old content by recycling it into something new. You may want to create content across a range of platforms and mediums or you may want to focus on converting your content from blog to podcast, for example, until you have mastered converting to a new medium. Whatever approach you take, as long as you add new value to the repurposed content and pay attention to the forms and conventions of the medium you are converting into, you will soon reap the rewards of greater reach, engagement and lead generation.